The Cinque Terre is a rugged, coastal section on the Italian Riviera and is composed of five villages. The villages are known for their beauty, culture, food, and proximity to one another. Produce carts are commonly found in each village marketplace. 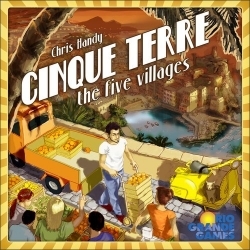 In this game of strategy, players compete to sell the most valuable produce in the five villages. Players act as farmers and operate carts in which they will harvest produce and deliver them to the five villages to sell. Additionally, players will compete for Produce Order cards, which reward Lire for selling desirable produce in specific villages. Players track sold produce in each village using their Fulfillment Cards. The winner is the player who gains the most Lire by selling valuable produce, gaining popularity in the villages and fulfilling Produce Orders.